Big Dawg Productions brings the story of Robert Harrell back for another run. If you missed it the first time, here’s your chance. The play will run at 8 pm for 5 nights, July 29-August 2nd,,2015 at the Greenfield Lake Amphitheater. Tickets ($20.00) can be ordered at the web site: http://www.bigdawghermit.com/ or purchased at the door. Big Dawg will be keeping the same cast as the original Wilmington and Southport productions and the same director so the show is only bound to grow stronger as the cast and director are well versed in this history and truly immersed in the roles of their characters. TheatreNOW’s summer dinner theater show features a look at an often overlooked aspect of Federal Point’s history. Shows run at 7pm on Fridays and Saturdays through July 25, 2015. 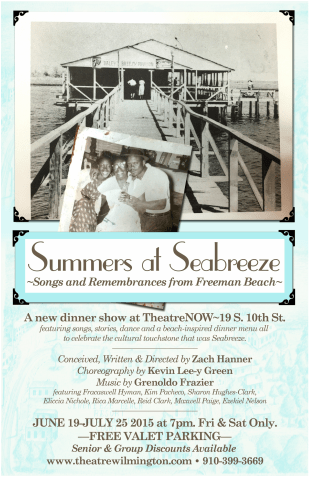 Tickets are $34.00 ($26.00 for children and seniors) include dinner that includes a menu drawn from Seabreeze’s original cuisine – including the famous “clam fritters.” Or tickets for the show alone are $20.00. Wilmington Star-News Review: “‘Summers at Seabreeze’ feels particularly timely, even as its focus is on the past. It’s a reminder that, no matter what those filled with hate may think, the history of the African-American community has a value, and a beauty, that can’t be taken away and won’t ever be forgotten.”~ John Staton.